Coming to Maui this weekend and looking for free ‘ukulele lessons? 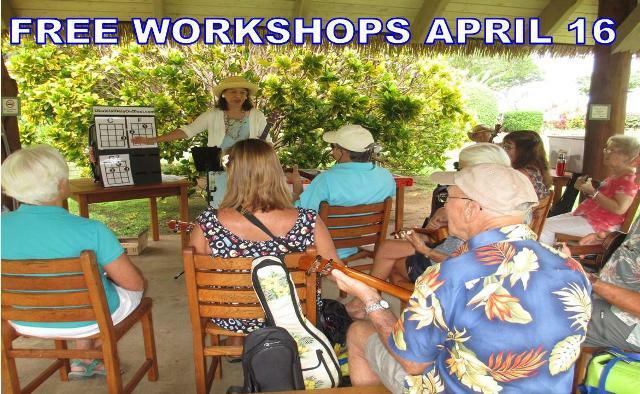 Bring your ‘ukulele to participate in two free ‘ukulele workshops at 9:00 a.m. and 11:30 a.m. this coming Saturday, April 16, at Ka’anapali Beach Hotel. Players who know how to form C, F, and G7 chords and strum a little will have an easier time as we learn different strums to fun, sing-along songs. Beginners are also welcome. A few instruments will be available for use by hotel guests for the workshops. Once hooked to the Ukulele Mele method, you can continue learning through private lessons on Maui or via private webcam lessons, online lessons for self-study, or packaged song sets of book/DVD/CD. These workshops are part of the weekend long 8th Annual Maui Hawaiian Steel Festival. The festival is presented by the Arts Education for Children Group, the Ka’anapali Beach Hotel, and Hawaii Institute for Music Enrichment and Learning Experiences. I am honored to be returning for my 5th year of teaching ‘ukulele workshops since 2012 when Henry Allen was in charge and the event was called the Henry Allen Hawaiian Steel Guitar Festival. Alan Akaka has been in charge since 2013, and the event name changed to Maui Hawaiian Steel Guitar Festival. Visit the festival website for more information. Read testimonials from past workshop participants. REGISTER ONLINE TODAY to save your seat for the 9:00 or 11:30 free ‘ukulele workshop.